In which you learn you're not the benevolent ruler you thought you were. Most resource-management kingdom-ruling games start you out slow—a tilled field here, a small factory there. A handful of villagers and ample time to build a wall before you’re attacked by invaders from the north. But not Reigns. Reigns isn’t your typical resource-management game—not at all—but you will be required to manage resources (to some extent). Reigns is a mix of genres: Resource management, choose-your-own-adventure, decision-making, and… Tinder? Here’s how it works: You’re the ruler of a kingdom (no intro, you’re just thrust right into it—like real-life, I suppose), and you rule your kingdom by responding to random events with decisions. The random events come from a stack of story cards, and the decisions are made with swipes (like Tinder). Some decisions are good and some are bad, but most are ambiguous—they could be good or bad, depending on your kingdom’s resources and how you want to be seen. Too many bad (for your kingdom) decisions could result in your death, but too many good (for your kingdom) decisions could also result in your death—so the key word here is balance. You already know the mechanics, but you’ve never seen them like this: Reigns is definitely one of the most unique games I’ve played—it’s a card game, but you make decisions by swiping left or right… like you would in Tinder. Except, instead of judging people from Facebook photos and a couple of witty sentences, you’re deciding whether to close the south borders or attack the kingdom to the east. Okay, so it’s not really like Tinder, because each swipe offers you different choices (not simply “yes, I want to date this person” or “no, not interested”) that affect the outcome of your reign. However, the Tinder-like swiping mechanism is super intuitive (even for people like me, who don’t use Tinder), and it makes for a smooth adventure game with zero learning curve. 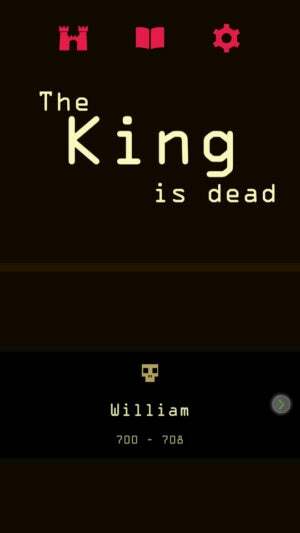 And since “easy to pick up and play” is pretty much the essence of a great mobile game, Reigns’ ultra-simple gameplay is a winner. You need to keep your resources balanced to remain in power (and alive). Swiping is easy, but winning is not: Reigns may have one of the simplest game mechanics ever, but that doesn’t mean it’s easy. Each chapter—or, well, reign—begins with a stack of shuffled story cards. You’ll need to make a decision for each card you draw, and most of the decisions you make will drastically affect your reign. At the top of the screen, you’ll see four icons that represent categories of power: Religion (cross), popularity (person), military strength (sword), and wealth (dollar sign). If you want to succeed, you’ll need to make sure these categories are relatively balanced—if one gets too low, you’ll fail, but if one gets too high, you’ll also fail. With each decision you make, you’ll see your categories rise and fall. If you choose to build a new cathedral, religion will rise and wealth will fall. If you choose not to burn witches at the stake, popularity will rise and religion will fall. This is just one of 26 different ways to die. It’s not easy being on top. Many of the decisions you’ll be asked to make in Reigns aren’t easy—there’s no right or wrong answer, and either choice will mean falling in one category and rising in another. You’ll find that you often need to make brutal decisions to keep your categories balanced (for example, you might need to sacrifice popularity to gain more wealth). It’s very difficult to keep the categories balanced, and even if you do achieve a perfect balance, you could still end up failing. You’re often just one decision away from being dethroned and beheaded by your people. 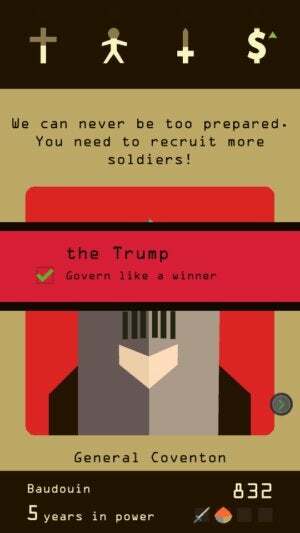 Reigns isn’t a game you “win,” but the goal is to remain in power for as long as possible without getting killed. 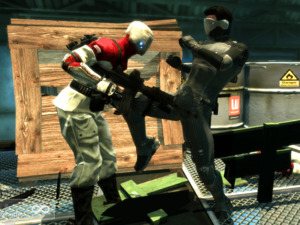 Just don’t be surprised if your first several attempts end in swift death. 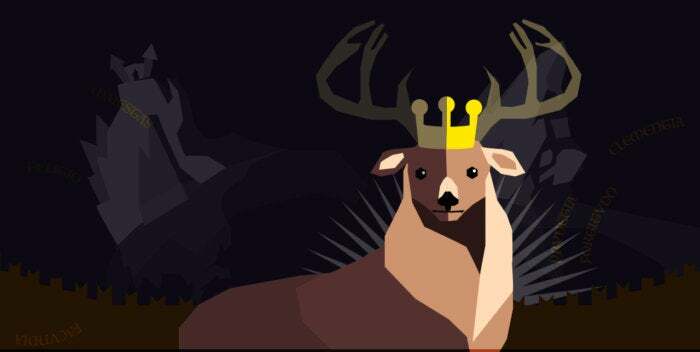 It’s an adventure: Reigns is basically a choose-your-own-adventure game in swiping/card format. But it’s also a much bigger adventure than it lets on: As you progress through the rises (and falls) of different rulers, you’ll be asked to complete mini challenges and you’ll meet new characters based on the decisions you make. Complete mini challenges during your reign, and you’ll be rewarded with new cards, content, and accolades. When you complete these challenges and meet these new characters, you’ll sometimes be presented with new cards that will add to your story deck. These cards will remain in your deck even after you die, so new games will start with even more choices and game options. And don’t think this is going to be your typical fantasy-kingdom-choose-your-own-adventure storyline—the game is well-written, with lots of snarky commentary on your choices, and features some interesting (and totally unexpected) tangents. 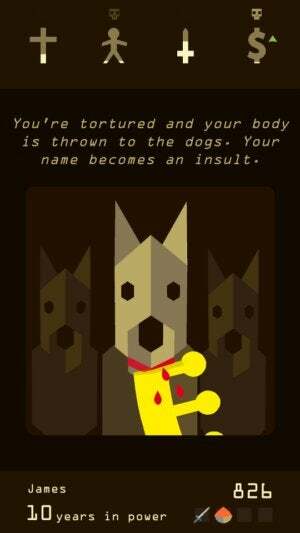 You’ll meet animal companions, attempt sword-fighting via card-swiping (it’s not easy, but you can always pay someone to help you out), and get lost in an endless maze of dungeons. And eventually you’ll die—in one of 26 different ways—before starting a new reign over… and over… and over again.